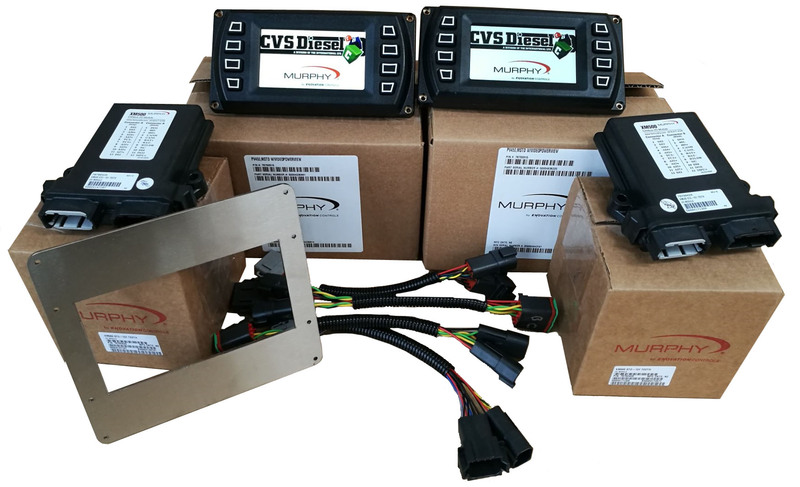 As an Enovation Controls Distributor, CVS Diesel supply a number of customers with Murphy screen kits. They are completely configurable to suit any requirements and as part of our service we work with the customer to make sure they get everything they need from these kits. The screens can be programmed to display all the relevant engine and vehicle information, including any logos or styles of gauge that are desired. The XM500 boxes pictured above are analogue to CANbus converters, these can take signals from analogue senders; including fuel level, pressure, temperature and RPM, converting them to a standard J1939 CANbus protocol. Again, these are fully configurable to suit all needs. At CVS Diesel we know that ease of installation and operation is key to any equipment. That is why we can also supply bespoke wiring harnesses and adapter plates to make the installation as quick and as easy as possible. We even supply the kits with detailed fitting and operating instructions, tailored to the equipment and configuration supplied. For more information on either a one off upgrade or multi unit production kits please contact us directly on 01604 590977, sales@cvsdiesel.com or click here to complete our enquiry form.